The most affordable 4-inch Android smartphone is finally here! 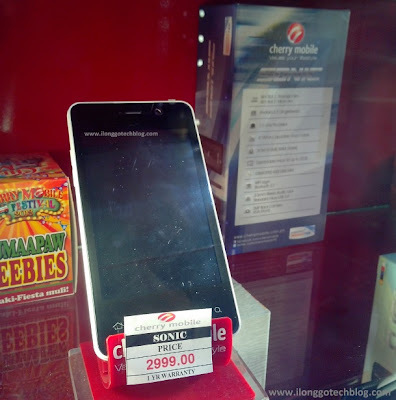 For only Php2,999 (SRP), the Cherry Mobile Sonic is one of the new Android phones that came out since the recent announcement of the Cherry Mobile Festival 2013. The 4-inch Android also boasts a dual SIM, dual standby capability, 1GHz processor, 256MB of RAM, 512MB of internal storage, 2MP main camera (VGA front) and runs Android 2.3 Gingerbread. More about the Cherry Mobile Sonic specs and features after the jump. *Some of the specs of the Cherry Mobile Sonic is still not available at this moment. We'll update this post once we know more, so stay tuned! Nd po ako sure sa tilting baka same po ito sa CM Spark TV. Gagana nmn po temple run, candy crush at iba png games. Nd po ako sure sa tilting.. baka wla po ito tilting. hello po ask lang po sana aq ! bakit nag low memory parin kahit nasa memory card na naka lagay ang mga apps? Mababa po kasi yung Ram at Rom nang sonic ..